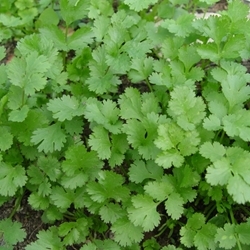 Cilantro is used in many types of cooking such as Mexican, Asian and Mediterranean dishes. The seed of cilantro is known as coriander. This plant prefers full sun and cooler spring weather. It will tend to go to seed in the summer months. Available in a 2x3 inch cell. All plants are certified organic. Select here for transplant information, pick up and order dates. Excellent variety of cilantro that is slow to bolt.